I had an unexpected freeze and had to harvest my datil and red fatalii peppers while most were still green.... though some had turned. My question is: Will they still turn? And if not, I'm open to suggestions of how to make the best of the situation. Theirs another thread on this, If I recall the answer is No they will not turn. My experience is- some will, some won't. I've put em in a paper bag with a banana and some didn't. Some did. So, unless you want to make a green sauce, put them in a bag. Will hanging my plants help? The problem with this is that they really shouldn't. Capsicum spp. does not have an ethylene hormone pathway for maturation, which is exactly what we're trying to achieve when putting unripe fruit in close contact with ripe fruit (which leaks ethylene gas to the immediate atmosphere). Yes really, this is how this trick works! However, if the fruit is immediately picked the cells should still "be alive". It's not unreasonable, as far as I know, to expect the maturation to continue at a well lit window sill or something. But YMMV since I've not tried experimenting or researched this further. Edited by SwedishGhost, 15 October 2017 - 08:35 AM. Thanks for finding that thread for me... it's very helpful. I've now got half the green peppers in a bag with a ripe banana and I have half in a sunny place. It will be interesting to see what happens! I'm working the banana trick right now. It'working wonders on anuums like paprika, urfa biber and gochu, sporadically on pubescen, not at all on bacaatum or chinense, not for me anyway. My orange thai, another anuum, didn'get the memo. Out of a hundred or so not one has started to turn. Amazingly, some of the chinense is spontaneously turning color, mostly the superhots, but they're just in a produce box in the garage, no ethylene enhancers. Science! Please let us know how it goes. Some people actually prefer green datils. Datils dont really turn once picked unless theres already a bit of yellow on the pod. 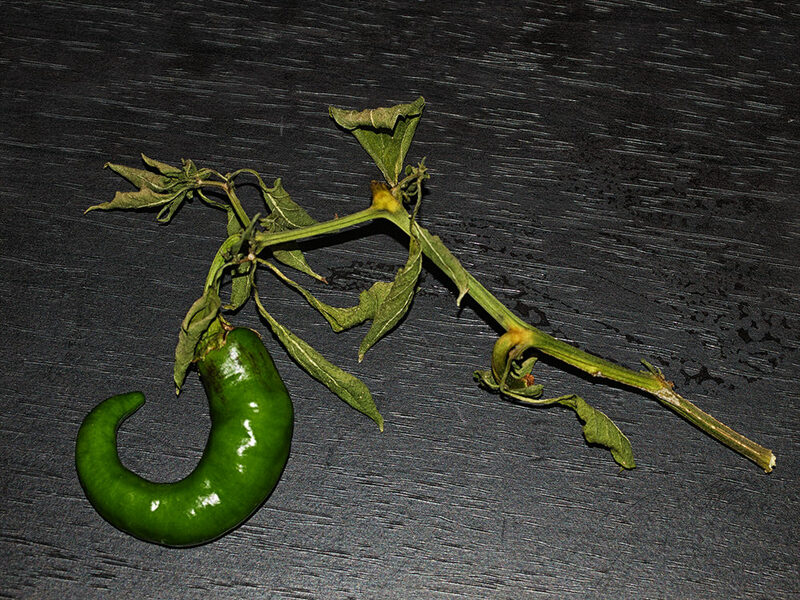 My best suggestion is to make a hot sauce with the green pods... thats the best use for green datils IMO! I had some mystery peppers from the grocery store that I forgot about in the fridge and they turned. They were light yellow when I bought them and they turned orange. unless it's annums they won't ripen unless they already started to. pickle the green ones, the weird flavors sometimes mellow out over time. Edited by peppamang, 24 October 2017 - 12:55 PM. OK... it's been a few weeks now. I had placed some of the green Fataliis and Datils in a paper bag with over-ripe bananas and and an equal amount on a plate on a window sill (no banana). Most of them have turned no matter where they are. There are a few stubborn ones that aren't turning but that's a minority. Its been a few weeks for this guy, broke off accidentally, no ripening. I would've tried keeping the branch in water like you were trying to root it.